In Thomas Mann's Doktor Faustus, the Christian humanist narrator asks the Nietzschean artist, "Can anything compete with love?" and the Nietzschean artist replies, "Yes, being interested." Love is the message of Christian tradition; being interested is the message of modern criticism and the fascination with novelty. For Mann, "being interested" drives rational criticism, which undermines both Christian faith in the power of love and Romantic faith in the power of human solidarity; but then rational criticism can be self-destructive. 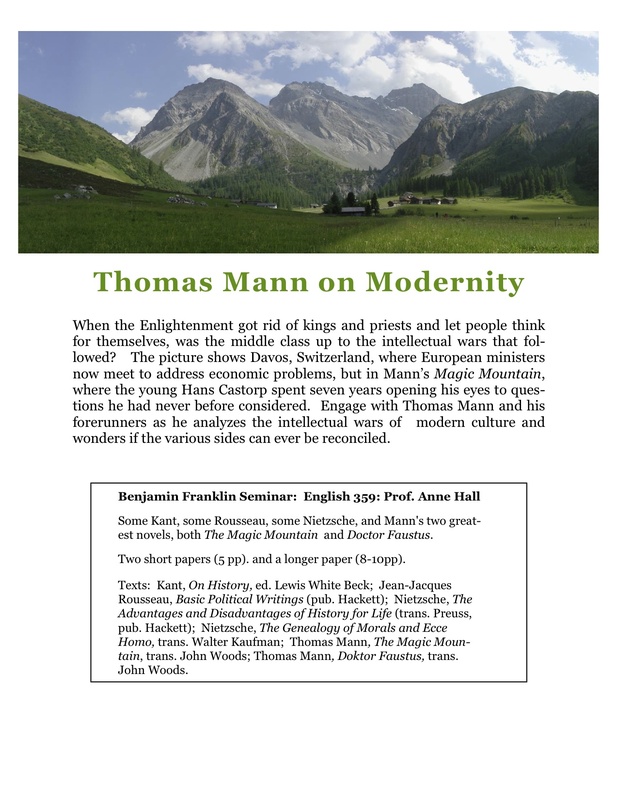 This course looks at Mann's reflections on the tensions and contradictions of modern culture in his two greatest works, The Magic Mountain and Doktor Faustus. We will read several short works by Kant, the First and Second Discourses of Rousseau, and Nietzsche's Genealogy of Morals. The course will culminate in Mann's two novels. Mann’s books being long, the student would be well advised to get started reading them over the summer, in the translation by John Woods, not the translation by Lowe-Porter. Besides, a book is better the second time through. Two short papers (5 pp). and a longer paper (8-10pp).